The final year of high school, just a few weeks before the final exams. 12 months on from the triumphant and patriotic Sydney Olympics, there was still an optimism and energy in the air of what the new millennium would bring. On the other side of the planet, seemingly out of nowhere, New York and Washington were attacked. On September 12 Australians woke to the unbelievable vision of the World Trade Center twin towers collapsing. Optimism was replaced with shock, sorrow and fear. Nearly 14 years later, there was something compelling me to visit the place where the towers once stood. The place where everything had changed. The place that had become known as ‘Ground Zero’. Approaching the site revealed, to my surprise, that it is very much a work still in progress. An organic set of graceful white spines, which could only be a creation of Architect Santiago Calatrava, was being worked on by a squadron of boom lifts. Construction hoarding and temporary fencing acted as funnels to direct the large volumes of visitors into the site. Overlooking the site is the shining blue glass of the 541 Metre tall, One World Trade Center skyscraper. This single commercial tower is now the tallest in New York City, but seems to struggle architecturally with the importance and gravity of what it is to represent. Originally designed by Architect Daniel Libeskind, the tower underwent a substantial and controversial redesign by American architect David Childs. The simple elongated triangular form and stock standard curtain wall of glass gives this building a sense on anonymity, which is only broken due to the imposing height and over sized aerial on the roof. Back at ground level sits the memorial site of the September 11 attacks. Most striking is the theme of absence which has been worked throughout this site. Marking the absence of the fallen towers are the sunken reflection pools. The cascading water around the edges of the reflection pools give the space a solemn feel and a sound that sets it apart from the rest of the city. Surrounding the pools are the names of the 2,977 victims of the atrocity, the letters cut out on the black steel plates, further continuing the theme of absence. Close to both the north and south tower reflection pools sits an angular steel and glass building. In comparison to the voids of the pools it feels like a small commercial building that could be a food court or a building lobby. Similar to the One World Center Tower the exterior appears corporate and un-engaging, perfectly camouflaged against the business centre of New York City. This building is in fact the entry to the incredibly popular 9/11 museum. Once through the outdoor queuing space and the security checkpoint just inside, the visitor is taken below ground via a broad staircase. Moving into the semi dark space below a series of images and videos along the way describe the events leading up to that fateful day. At the end of this section the space suddenly opens to reveal a large open void with the continuation of the museum space below. On one side of the massive void is the original concrete retaining wall built to keep water out of the precinct. Just after the attack, there were fears that this too might have been damaged or destroyed by the collapse of the towers. Fortunately this was not the case. Moving further down into the lowest and largest area of the museum reveals a series of curated spaces. Artifacts, artwork and digital displays all piece together stories of people. One such artwork by Spencer Finch is entitled ‘Trying to Remember the Color of the Sky on That September Morning’. The mega scaled work takes squares of different shades of blue and samples them across a vast wall. Around the perimeter of where the twin towers once stood all that remains of the original buildings are the top of the footings. At this level we can see where concrete stopped and steel started. Here the museum interacts with the 21st Century ruin in the same was as one might expect if it were thousands of years old. Visitors can walk on either side of row of columns which are ‘protected’ by a balustrade rail. The strangest aspect of this museum is the fact that it is a history museum of relatively recent events. A short subway ride away tourists can visit the Metropolitan Museum of Art and inspect objects thousands of years old. Here in the depths of ground zero, the same protocols apply but the artifacts in many cases are less than twenty years old. This is not by any means a criticism, or an attempt to belittle the significance of the collection; rather it is an observation of how people respond to the site of such an extraordinary and traumatic event. Undoubtedly the work by Michael Arad of Handel Architects on the museum and memorial is very successful in its design. Whilst the above ground museum entry is underwhelming, the spaces below ground connect and resonate with the gravity of the place. There is no question that this place is a now a sacred site, as well as a tomb, it is also an historical museum and an education place all in one. As time passes it will be the educational and historical aspects that will become more important to understanding the early 21st Century. In response to terrible loss, it is human nature to seek remembrance by marking a place. Architecture is critical to this process by resonating the very human expression of grief and acting as a permanent reminder of what happened and what was taken away. 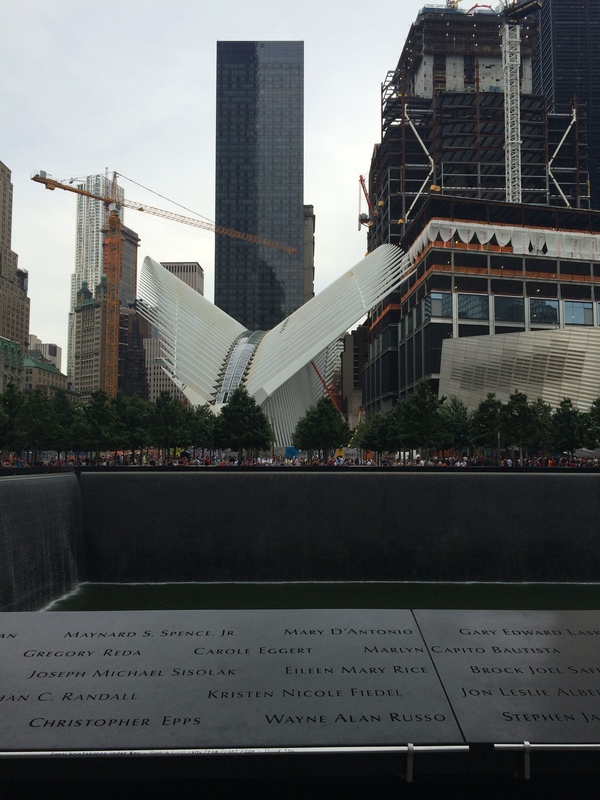 This entry was posted in all posts, International, Review, Uncategorized, Urban Design and tagged Daniel Libeskind, David Childs, Ground Zero, One World Trade Center, Santiago Calatrava, September 11, twin towers, World Trade Center, World Trade Center 1. Bookmark the permalink. Thanks for sharing this. I was there in 2012 and unfortunately the area was closed due to Hurricane Sandy. There was a sense of sadness however and you are right, it is even more striking due to the recent memory of the actual event. I must get back there and have a closer look some day. Thanks for your comment Jason. It is an amazing place to visit. Perhaps the most similar place to Ground Zero I have visited is Pearl Harbor. Similar in the pointless loss of life and similar in the way it changed world history. 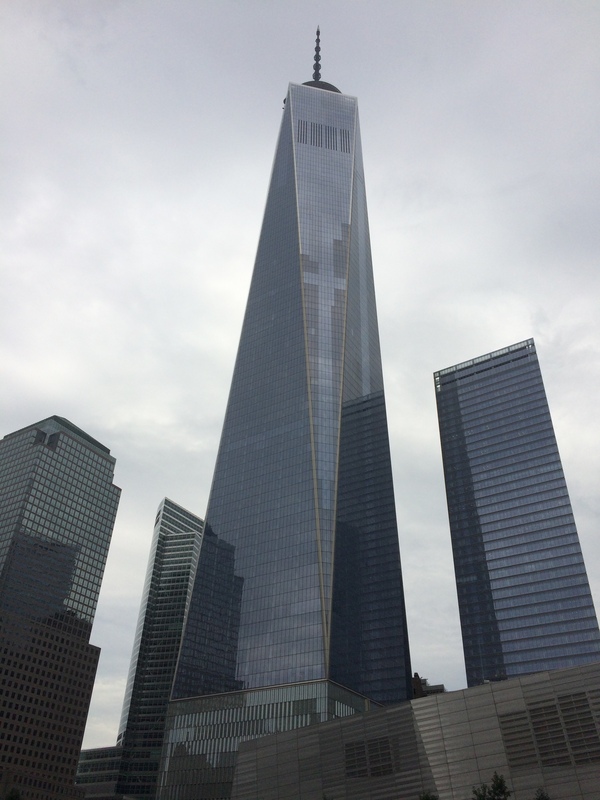 The recent nature of the World Trade Center brings a different dimension to the experience. It is currently more a place of remembrance than commemoration.